Mini-Magnetospheric Plasma Propulsion (M2P2) is an advanced plasma propulsion system that will enable spacecraft to attain unprecedented speeds, with minimal energy and mass requirements. The high efficiency and specific impulse attained by the system is due to its utilization of ambient energy, in this case the energy from the solar wind, to provide the enhanced thrust. 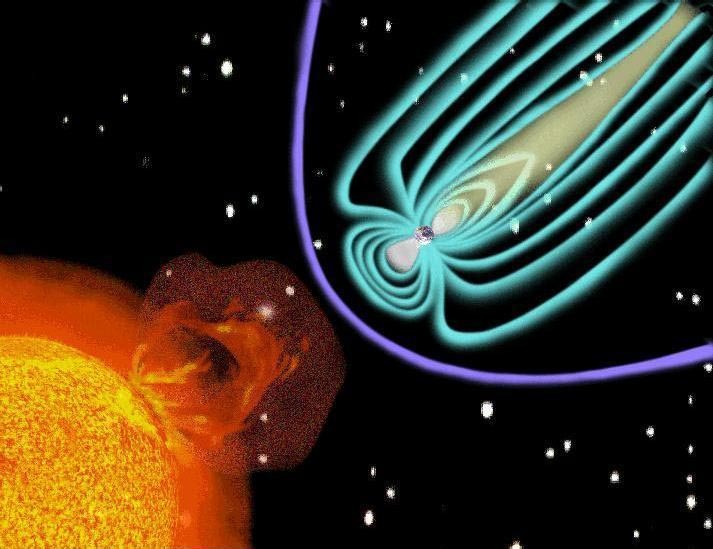 Coupling to the solar wind is produced through a large scale magnetic bubble or mini-magnetosphere generated by the injection of plasma into the magnetic field supported by solenoid coils on the spacecraft. This inflation is driven by electromagnetic processes so that the material and deployment problems associated with conventional solar sails are eliminated. The M2P2 design mimics nature. The sun creates mini-magnetospheres or `magnetic clouds' during coronal mass ejections, as seen in the figure. The earth itself has a magnetosphere, produced by the terrestrial magnetic field and plasma resulting from the ionization of the upper layers of the atmosphere. The M2P2 will parallel these naturally occurring systems by creating an electromagnetic bubble or mini-magnetosphere around the spacecraft. A schematic of how the M2P2 would interact with the solar wind. The obstacle or mini-magnetosphere produce by the M2P2 is shown in purple. The solar wind flow (white lines) is deflected around the obstacle and its momentum is picked up by the spacecraft. The contours show the density of the solar wind with red indicating enhanced densities as the solar wind piles up at the obstacle and purple low density where the solar wind no longer has access. The magnetic field will be supported by solenoid coils on the spacecraft. By injection of plasma, the size of the bubble can be greatly increased from a small size (left) to a large size (right), for which the interaction with the solar wind (arrows) is greatly increased. 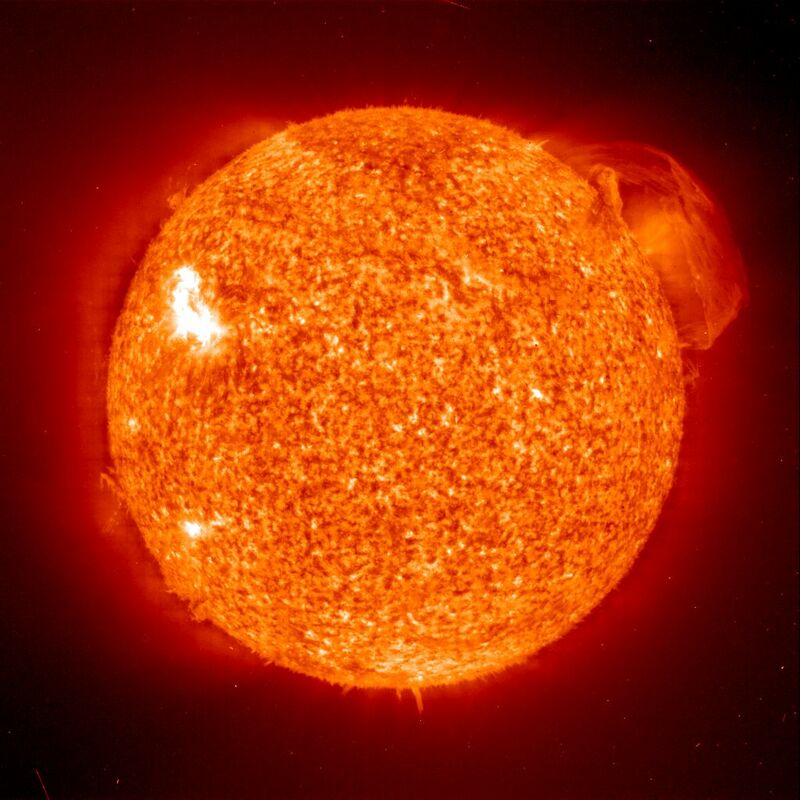 The solar wind travels at 300 - 800 km/s (Seattle to Washington, DC in ten seconds or fewer). Like the balloonists traveling the winds of the Earth, the mini-magnetosphere (which is attached to the spacecraft) will be picked up by the solar wind and attain similar speeds. An early schematic of the device. Images of the plasma source and magnetic field coils in a plasma tank at the University of Washington. The making of plasma through radio frequency heating of helium. The waves generated by the antenna (braided copper wire) produce the ionization of the helium which results in the pinkish glow, and the generation of a very dense plasma. The prototype operating in argon. The device is illuminated from the outside so that the magnets can be seen. A stream of plasma is faintly visible to the right. As above but with no backlighting. The formation of a plasma loop to the right can be seen, mimicking the loops seen on the Sun. Want More? See the computer simulations showing the device in operation.